Sorry, if Hollaback Girl had to be stuck in my head the whole time I was making this, it’s got to be in yours too. It’s finally March! Who’s ready? Honestly, the end of February… is there a worse time of year? It’s dark, it’s gloomy and it’s cold. Well, most places it is. In Hawaii, it’s sunny and warm, but there’s still that funk that sets in post-holidays while waiting for spring to roll in. The GREAT news is my kitchen is up and running! I don’t want to share pictures yet, because we still need to do the backsplash and the lights over the island. That’s all cosmetic though, so my cooking life has gotten 1000% easier now that I have counter space, a sink/dishwasher and all my stuff put away in the proper cabinets. If you want a sneak peak, you can see a few videos the remodel process on my Instagram highlights: @thepickygourmet! Since starting my blog a couple years ago, I’ve collected lots of cute bowls and platters and specialty dishes to use for pictures and recipes. Basically, if I see something I don’t have, and it’s on sale, it’s mine. (I’ve been on the hunt lately for a good deal on copper mugs for Moscow mules, for instance.) Sometimes I even forget I have stuff, which is the good thing about moving so much. I discover things in my own kitchen and get inspired, and this time it was my ramekins. Sidenote: I learned I had no idea how to spell ramekins before I wrote this post. I tried, and in the words of Lloyd Christmas, “I was way off.” Thanks, spell check! I decided I wanted to make something warm and cozy for everyone suffering through the end of winter and I settled on bread pudding. Not only is it perfect for this time of year, it was perfect for me because I had everything I needed already in my pantry. 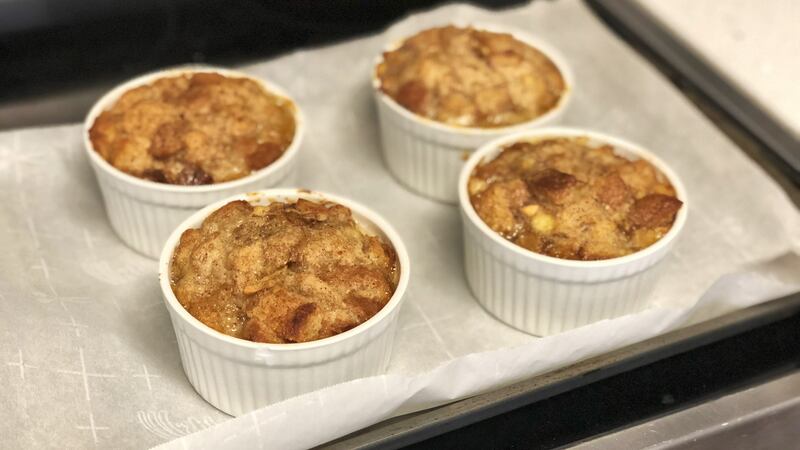 I love bread pudding because it can be a dessert, it can be a breakfast, it can be a snack… there’s never a wrong time for it. Grease four ramekins liberally with cooking spray or butter. 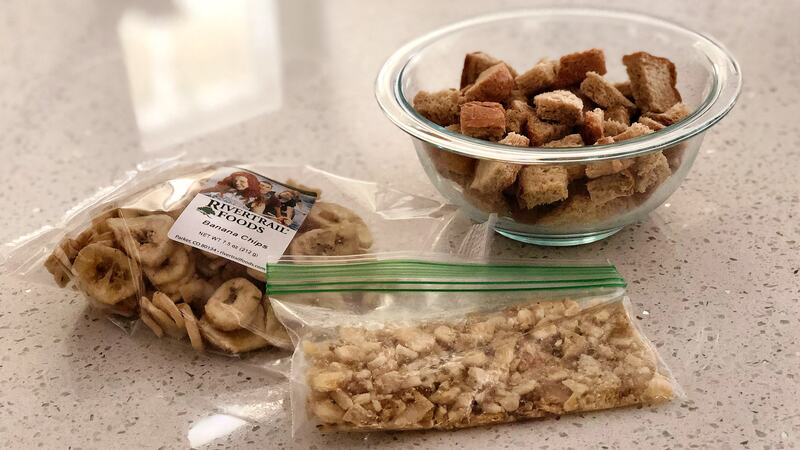 Cut the bread into small cubes and toss with the crushed banana chips. Divide it equally between the ramekins, making sure to leave some room for them to rise when it bakes. In a bowl, mash the banana until smooth. Add the eggs, milk, butter, sugar, vanilla, ginger and cinnamon and whisk vigorously until all ingredients are well-incorporated. Carefully pour the mixture over the cubed bread in the ramekins, without overfilling (you may have a little leftover). Use a spoon to pack it all down, making sure all the bread is covered in the liquid. Cover and refrigerate for at least an hour up to overnight. Preheat the oven to 350 degrees and place the ramekins on a parchment lined baking sheet, in case any of them bubble over. Bake for 35 minutes, or until a fork comes out clean. Obviously the wildcard here is the banana chips. I know those aren’t always in everyone’s pantry, but they aren’t hard to find at the store. You could also substitute for dried apples or cranberries or whatever you’re into. I have always tried not to let food go to waste and now that we bought a home and are remodeling, I’m in full-on penny pinching mode when it comes to groceries. In a household of only two people, it’s hard to finish a whole loaf of bread sometimes before it gets stale. Bread pudding is an awesome way to use it all up, especially the heels, since no one ever wants those for a sandwich. If your bread isn’t stale, leave it out overnight to dry it up. It actually absorbs more flavor when it’s stale. You can make this in an small baking pan if you don’t have ramekins or prefer a more family style presentation, but I like being able to make exactly the amount of servings I want or being able to adapt the recipe to the amount of bread I have to use. You can also make a couple the first day and save a couple in the fridge overnight for day two. Bread pudding before going in the oven. Remember, they will rise like a souffle in the oven! 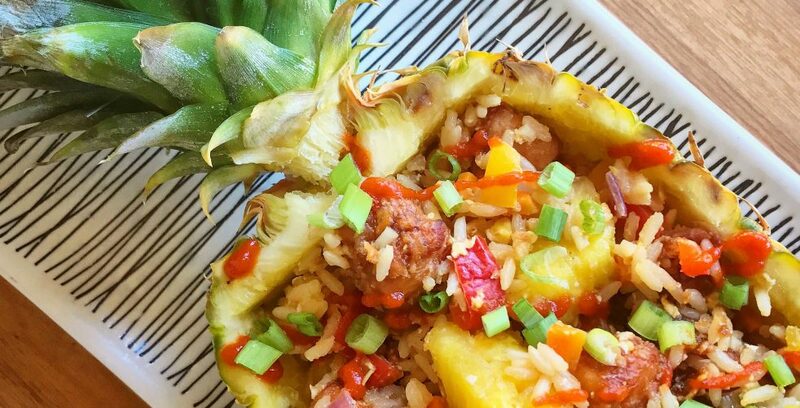 Having individual servings is also fun because you can try out different toppings. 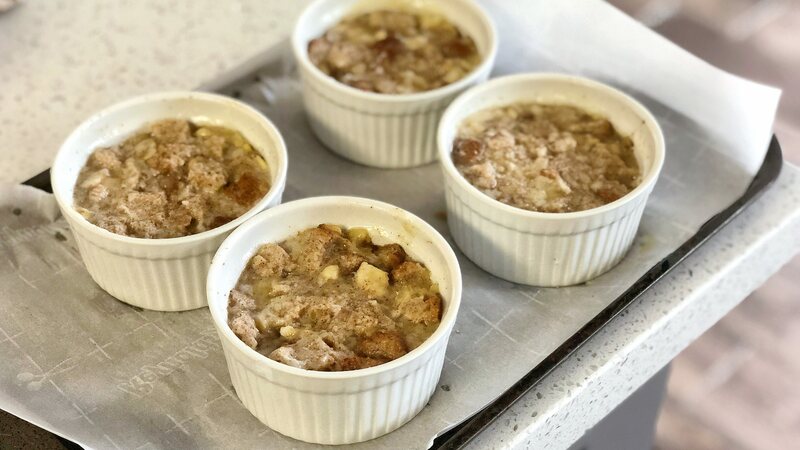 This bread pudding is not overly sweet (which I like) but you can always get fancy and add some powdered sugar or maple syrup before serving. Adding some chocolate chips into the mix would be a big hit with kids. Well, I’d love to stay and chat longer but I’m actually heading off to my first luau tonight! I need to fuel up on bread pudding and start getting ready. I’ll be back soon with another new recipe and (hopefully) the final before and after photos of the new Picky Gourmet kitchen. See you then! Lovely recipe and a girl can never have enough bowls and serving dishes! Also have you tried freezing bread? In a house of two it’s our way of preserving it and works well….